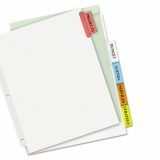 White or buff paper dividers with clear or multicolor insertable tabs. Note: A minimum quantity of 144 must be ordered, and in units of 36 thereafter. 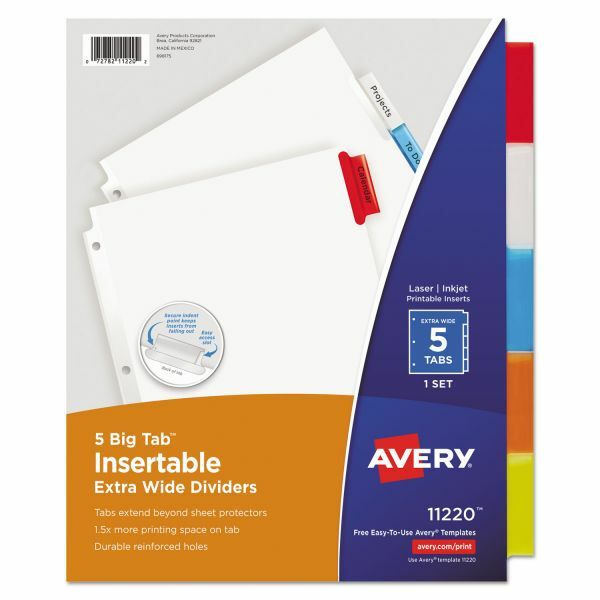 Avery Insertable Big Tab Dividers, 5-Tab, Multi-color Tab, Letter, 1 Set - Dividers feature a special tab design so inserts are secure yet easy to insert and remove. 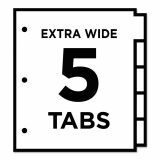 Bigger tabs and inserts provide 50 percent more printing space for tab titles than traditional insertable tab dividers. 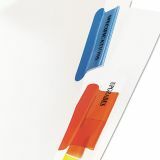 Dividers feature extra-wide white paper and single-sided clear-reinforced edges. Avery offers many easy-to-use templates for Microsoft Word and other popular software programs. 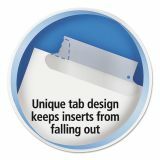 Create and update tab inserts using your laser and inkjet printer. Three-hole punched for use in standard ring binders, mini size 5-1/2" x 8-1/2" dividers are seven-hole punched for small binders and organizers, and legal size are 4-hole punched for legal size binders. Handwrite or print inserts on laser and inkjet printers.